← A little Christmas Box just for you! When I was little, a book was a book. It did not have buttons to press to produce squeaky sounds or sacks of felt puppets to re-enact the story. It did not give links to online videos or interactive maps either, because the world-wide web had not even been invented. Even today, a book does not contain moving images, if you are located outside Harry Potter’s wizard world… or does it? You could publish a book online and include audio and video features; but would it still be a book then or just another website? You could even expand it with a blog or a wiki; but it would surely lose its contours as a book and get blurred into the ocean of the internet? Can there be such a thing as a multimedia book, a fluid book, a ‘living’ book? These questions were hotly debated at a seminar on the academic book of the future at the British Library in January 2017, running up to the launch of a BOOC… about BOOCS. 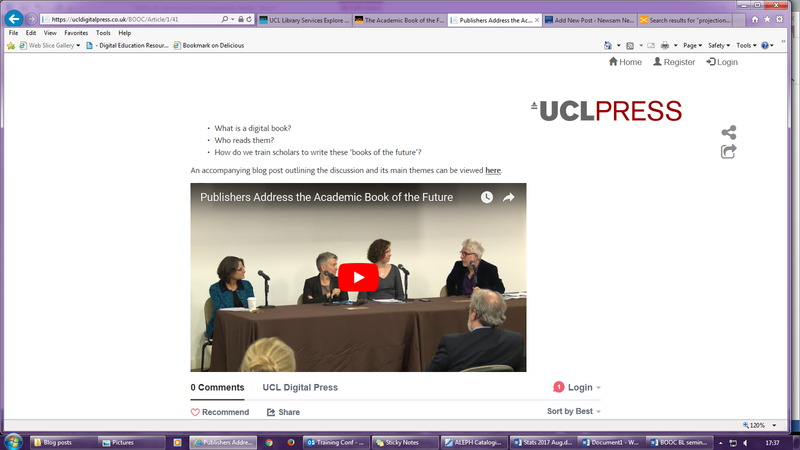 Lara Speicher and Jaimee Biggins of UCL Press introduced two radically new concepts: fully Open Access academic publishing and the BOOC (Book as Open Online Content). UCL Press is the only academic publishing house which is fully Open Access, putting the same titles which cost £15 or £20 in a bookshop online free of charge. The idea behind it is to advance research anywhere in the world but also explicitly to level inequality and eradicate poverty. This chimes in very well with the Institute of Education’s ethos of social justice. So far, UCL Press also has a focus on social sciences, including a series on social media and an education journal. Beyond that, UCL Press is developing a dynamic book: a book that indeed includes text and images plus podcasts, blogposts, tweet streams…. I would call it doubly dynamic because it has moving features and because it changes shape. It is also specifically designed to display on various devices. 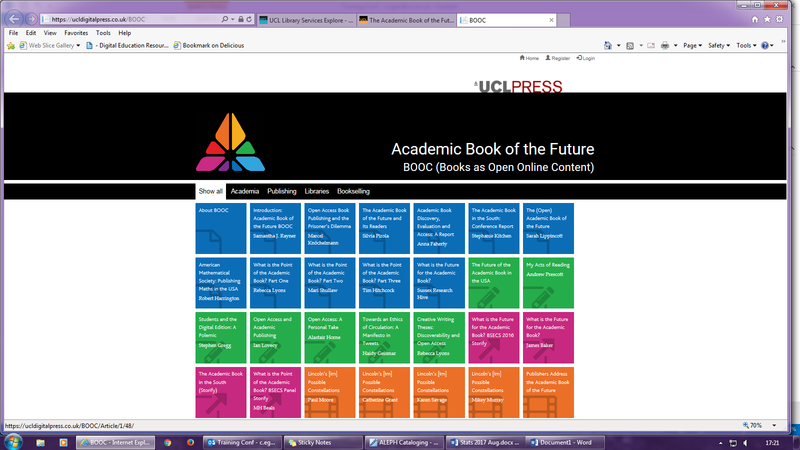 What, though, distinguishes UCL’s Academic Book of the Future from a website? As I gathered from the seminar, the BOOC is curated, under greater control than a blog would be: submissions in any format are peer-reviewed and approved by the editorial board. It gets updated regularly, which is also true for online encyclopaedias or databases – or, in fact, printed books going through many editions. Each chapter or item has a DOI as a permanent identifier, and the whole thing has an ISBN. So far, so good – but how do put such a book on the library catalogue, and how do you keep such a book on the library ‘shelves’? This one is supported by Arts and Humanities Research Council (AHRC) and the British Library; it is envisaged that the latter will periodically archive the content of the BOOC. There is an entry on the library catalogue, UCL Explore, but without an editor or a list of contents. When one opens the BOOC, the contents are displayed in multi-coloured boxes rather than a list of titles, with the colour indicating the nature of the contribution. Instead of chapters, you get different arrangements of coloured fields, with some naturally coming up under different headings! They also slide around nimbly when you adjust the screen. If you think all this is pretty bizarre, you have not seen anything yet. Like a “battery powered cinematic pop-up book” of Macbeth. I am not making this up (I don’t think I could): it is a quote from a recent project report by Marilyn Deegan. 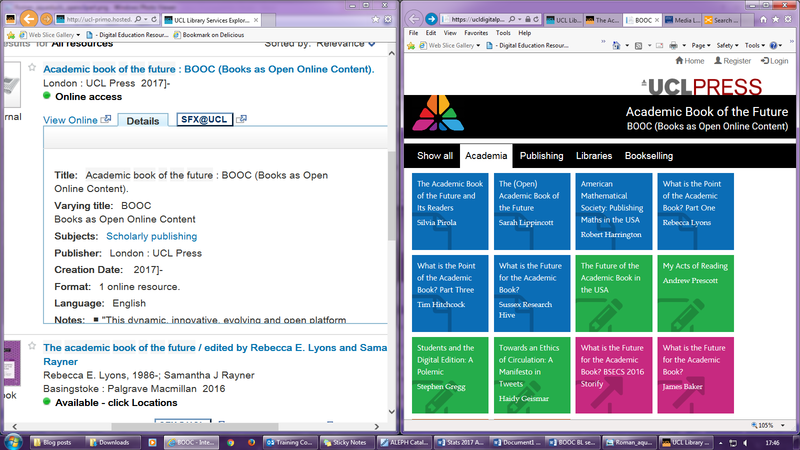 It is likewise called The Academic Book of the Future and, appropriately, accessible online and free of charge. There you can find brief descriptions of all kinds of multimedia BOOC projects. Interestingly, it was staff and students across the University of Lincoln who, during an intense workshop in May 2016, came up with a book model for the 21st century. The Collaboration Laboratory (co_LAB) prefers to call it ‘an interactive, multimodal system for augmenting the book’. Perhaps you will not be particularly surprised to hear that this concept goes beyond connecting resources of different types into the realm of connecting readers. The academic book of the future, as envisaged by co_LAB, will be personalised for and by the user or customised for and by a group. Yet on their web page, again entitled The Academic Book of the Future, the Lincoln researchers emphasise that all the high-tech and all the discussion should lead to ‘more refined, reliable and relevant’ content, and make academic knowledge ‘more inclusive and accessible’ (italics added). A report by Donald J. Waters stresses that a “fully interactive” book must be reviewed by peers to qualify as scholarly. It also addresses a number of practical issues: Will you actually own the book on your screen? Will it even be there two years later? Can you read and annotate it on all your devices? Apparently, the Scholr information system does not replace the printed or online book but complements it and always remains centred on it. As regards academic libraries, The Collaborative Laboratory hopes for some communal tagging and indexing… and for some more interest in libraries! My 20th-century brain imagines the BOOC as a complex climbing-frame or perhaps a space-station with a leather-bound volume suspended in the middle… If it will distract from an integral book entrusted to it, or unlock it and distribute its knowledge, only the, well, future will show. Source of screenshots: BOOC at UCL Press. 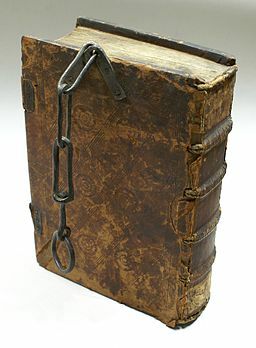 — Photograph of early printed, but still chained, book: By Michail Jungierek (Own work) [GFDL, CC-BY-SA-3.0 or CC BY-SA 2.0 de], via Wikimedia Commons. This entry was posted in electronic resources and tagged audiovisual resources, BOOCs, British Library, collaboration, digital library, Online resources, open access, UCL Press. Bookmark the permalink.